Investors have historically favoured companies that return capital to investors through dividends and share buybacks. That’s shifted over the past two years as traders have started to reward companies who invest in themselves. Going back decades, investors have traded stocks with their own best interests in mind. That means favouring companies who use capital to directly enrich shareholders. 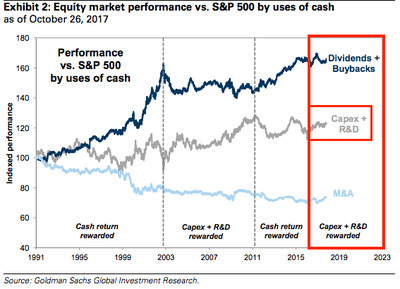 Since 1991, S&P 500 stocks offering the highest combined dividend and share buyback yields have returned an annualized 15.5%, according to data compiled by Goldman Sachs. That’s outpaced comparable returns for companies spending the most to grow their businesses organically — a measure also known as capital expenditures, or capex — and it’s also beaten returns for the benchmark index itself, Goldman data show. But as companies increasingly invest in themselves, that’s all changing. 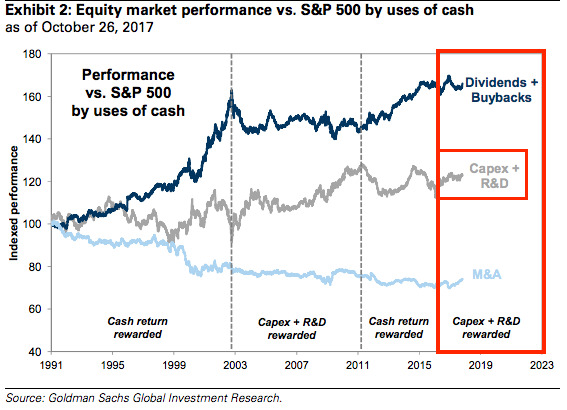 Since the beginning of 2016, a Goldman-curated basket of stocks spending the most on capex and research and development has beaten a similarly-constructed index of companies offering high dividends and buybacks by a whopping 21 percentage points. That outperformance has totaled 11 percentage points in 2017 alone, according to the firm’s data. That comes as Goldman forecasts companies will boost capex by 8% in 2018. And in their mind, it’s at least partially a reaction to economic conditions that are grinding out slight improvements over time. “Investors should continue to reward firms positioning themselves for future growth given a solid but unspectacular economic backdrop,” David Kostin, the chief US equity strategist at Goldman Sachs, wrote in a client note. Goldman SachsTraders are starting to reward companies that invest in improving themselves organically, a shift from the past three decades. So how do you take advantage of this? By zeroing in on the companies offering the most in the way of capex, of course.